Posted by Julie in astroturf, bonner and associates, cejapa, chamber of commerce, climate bill, copenhagen, G20, obama to copenhagen, tcktcktck. Copenhagen has passed and the Action Factory has packed up, moved out, and dispersed. This just might be the last post on our blog for a while. In the end, we did not get nearly what we had hoped for — neither a US Senate climate bill, nor a binding international climate treaty. …perhaps we can claim just a little credit for helping push Obama to go to Copenhagen? After all, we did give him a plane ticket for his birthday. And we gave him some flack when he went there to try to get the Olympics. …Or how about for influencing Arlen Specter’s far-from-certain EPW committee vote after we chased him in a SurvivaBall herd, all the way from the capitol into the Hart Office Building? … And finally, I suppose we can claim credit for the defection of a major paper company from the U.S. Chamber of Commerce. It happened just 1 day after we successfully pulled off an elaborate spoof press conference with the Yes Men in which we temporarily reversed the Chamber’s backward stance on climate policy. We may have even provoked the Chamber to dig itself into an even deeper hole and sue some of us… gee, that would make them look real bad… hmm…. oh wait, we did. The Chamber also sent a letter to Senators Boxer and Inhofe not long after our stunt, trying to play nice guy and directly assert supposed (feigned?) support for climate legislation, an act which Senator Kerry suggested would be a “Nixon to China” moment, if the Chamber really meant it. All in all, we had a lot of fun and made a lot of friends. We generated hundreds of media hits highlighting the dire need for climate action, and these were undoubtedly seen by hundreds of thousands. We hope that through our actions, we have inspired and will continue to inspire many, many more actions. 3. The bottom of the reflecting pool is slippery – enter boldly, but carefully and everything will work out fine. The Action Factory may be over, but our work is far from complete. In the final hours of the Copenhagen conference, a handful of countries – including Tuvalu, Bolivia, and Venezuela – made statements strongly opposing the undemocratic accord, which is essentially a death sentence for many low-lying countries. When one nation’s “unprecedented breakthrough” is another’s death sentence, something is clearly not right. That’s why in 2010 many of us will stay engaged with battles and creative actions in the Coal River Valley, within the US Senate, at the US Chamber of Commerce and elsewhere. Avaaz as an organization will take on the Chamber directly. We hope you will join us for the long haul — not just because it matters, or because the future of our planet depends on it, but because it is FUN. Thanks to all of you who have been along for the ride – it’s been a pretty wild one. See you in the streets. Posted by skolmk in copenhagen, obama to copenhagen. Sprinting across the puddle laden lawn of the National Mall? Easier said than done, especially when one is carrying eight 5′ artificial bodies sporting a very important message: CO2 Kills. The normally picturesque reflecting pool on the National Mall was witness to a grisly scene today, as we floated fake corpses face-down in the shallow water. A water-borne banner reading “Obama, Climate Change Kills / Earn Your Prize in Copenhagen” floated amongst the bodies, symbolic of the 300,000+ annual climate-related deaths estimated by former UN Secretary General Kofi Annan’s think tank. The mass of bodies was nothing short of what appeared to be a devastating climate change induced crime scene. The United States is posturing to take on more global responsibility with Obama now attending the final days of the Copenhagen climate talks [instead of just when it’s convenient to also receive a Nobel Peace Prize]. While the conventional wisdom leading up to Copenhagen suggested that this climate conference was doomed to failure, Obama’s change in travel plans shed a new light on the potential for greater success. The move was attributed to recent climate commitments from China and India, and signals that a Real Deal is a possible outcome of the conference. Unlike the casualties of climate change in the reflecting pool today, the treaty negotiations in Copenhagen are very much alive. Posted by Morgan in obama to copenhagen, tcktcktck. 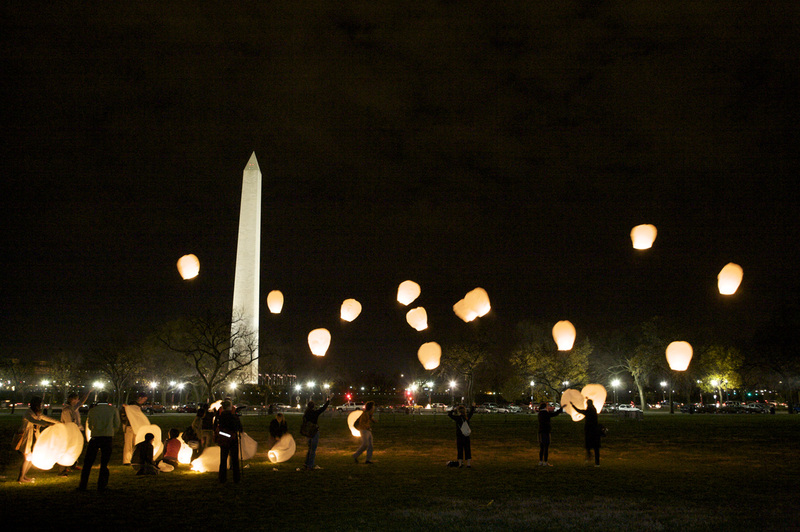 Tuesday evening, amidst a historic Beijing meeting between President Obama and Chinese President Hu Jintao, dozens of activists with the global campaigning network Avaaz.org released over one hundred Chinese flying lanterns and a floating balloon banner into the air just south of the White House. Chinese flying lanterns are a symbol of hope traditionally released to celebrate the new year. The Avaaz action highlights China’s proactive domestic climate commitments as a source of inspiration for the UN climate summit in Copenhagen this December. 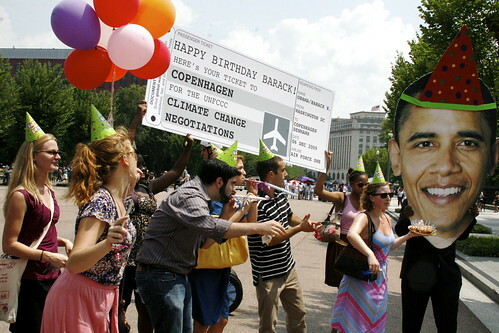 Posted by skolmk in copenhagen, flash mob, G20, obama to copenhagen, tcktcktck, Uncategorized. The DC Action Factory has hit the ground running in Pittsburgh, with our time drawing near to the first mass action of the G20 week: a global wake up call for climate action. 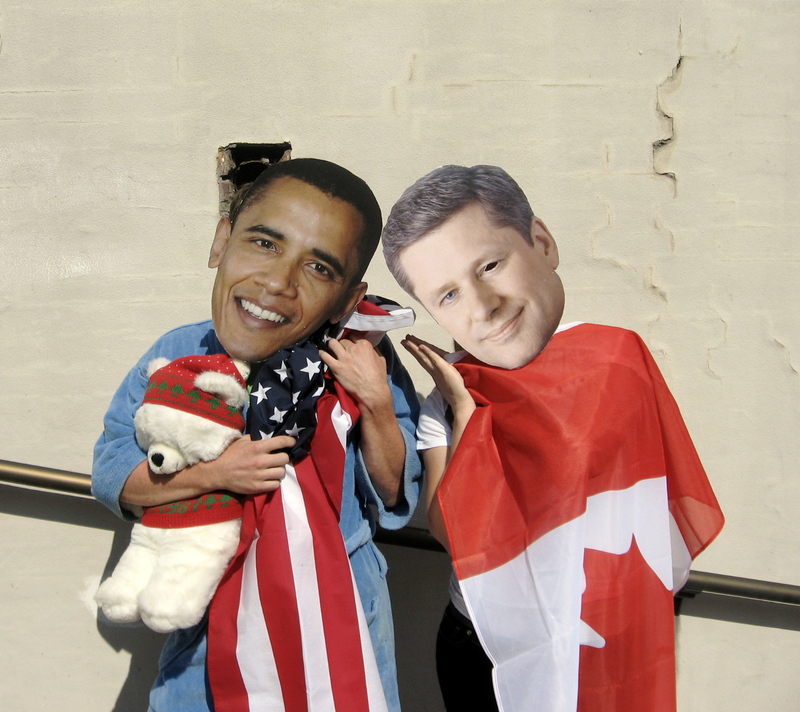 President Obama and Prime Minister Harper are going to be two of the four featured G20 leaders in tomorrow's action, sleeping on the job as the world demands stronger international climate policy this December. flags as blankets. The crowd will literally wake-up the G20 members and demand that they take bold action this week on climate policy that will lead us into a promising and productive Climate Change Conference in Copenhagen this December [the last day of this being 12/18]. Immediately following the flash mob wake up, everyone gathered will place calls to our Senators in Washington, demanding that they gear up to work diligently on climate and energy policy this fall, thus making a loud and strong flash mob on Monday (along with the 2,000+ other wake up calls worldwide) more important than ever. The action is promised to be a fun, exciting, and easy way to plug into the many events going on in Pittsburgh this week, and will last approximately 30 minutes. Tomorrow’s going to be huge, all over the world. Our wake up call is one of over 2,000 events around the world. This amazing coordination happens through the Tck Tck Tck campaign, which you should read about here if you haven’t heard of it yet. Also check out Kevin Grandia of Desmogblog writing about just how big and lout this is going to be. Part of the reason this even is so huge is that its paired with a global movie release. The scary view from 2050 about just how stupid we are acting right now as a the hilarious and chilling independent movie, the Age of Stupid. As of Today, there are 77 days until Copenhagen, and the action is only going to keep on increasing. Keep your eyes and twitter feeds on the lookout for the Senior Citizens March to end MTR and 350.org day of action. Posted by Morgan in Katrina, obama to copenhagen, tcktcktck. The days of planning, the nights of building collapsible roof structures and a giant banner all faded as I floated my roof into place, framing my message below the symbols of America’s greatness. “Help, the water is rising” Lincoln, sitting on your chair looking at the scene, what would you do? The George Washington Memorial, surveying the city looking down at us from above – what do you think of the coming storms? I remember the turmoil of hurricane Katrina four years ago, watching from afar. I was aware of the size of the storm, but I had no idea how far the destruction would reach because no one expected the levees to break and the entire city to flood. That surprising level of destruction, both of human life and the property of an entire city, is the memory that we now have of Katrina. Time is running out. The clock is tck-tck-tcking. There are only 100 days until Copenhagen. That is our chance, as global civic society, to agree on a plan for human safety and security in the face of crisis. Just as the federal agencies assigned to protect residents of New Orleans failed in the aftermath of Katrina, our government is failing us now in addressing climate change. The bright, critical spotlight of public consciousness was turned on FEMA in the aftermath, pointing out the million areas of incompetence and shortsightedness. But imagine what we will look like, 10 or 20 years into the future. They’re going to call this the age of stupid if we don’t exercise our power as citizens to demand action. The alarm needs to be raised, the church bells need to ring, the fire whistles need to sound and people like you and me should be taking to the streets. Al Gore calls on young people to engage in civil disobedience to stop coal plants, but won’t put himself on the line. Thomas Friedman accuses youth of sitting on Facebook instead of taking action. Well Mr Friedman, get out from behind your articles and books and take to the streets yourself. Global warming has been the primary issue for me for four years, since about when Katrina slammed into New Orleans. There’s been a lot of frustration, but I feel that we are close to a big turning point, a point of global consciousness. Our common need for security brings us together in common cause, whether it is our homes at risk of storm, our children’s health in danger of pollution or our national security threatened by turmoil. I don’t claim to speak for the residents of the Gulf Coast. But I recognize that hurricane Katrina is a point of reference for all Americans, giving us all a taste of the cost of climate inaction. Today is a day of reflection, both on tragedy, but we must also remember the bravery of the heroes. Countless New Orleans residents made self-less sacrifices for their communities. Barack Obama has made quiet but significant progress on rebuilding New Orleans and restoring the Gulf Coast, although we have a lot of work left to go. I’ve also been thinking about the legacy of Ted Kennedy, who spent 40 years defending the ideals of liberals, defending the poor and the underprivileged. On this day of reflection, this turning point, what are you doing to turn the tables for climate solutions? How are you pushing the boundaries? I’ll be making sure ALL my friends see this amazing photo and pass it on to their friends because I’m pretty psyched with how it turned out. Posted by Morgan in obama to copenhagen. 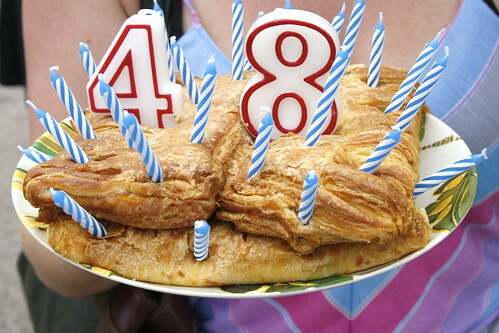 This December, the President will use his thoughtful birthday present to fly to the UN global climate treaty negotiations in Copenhagen, Denmark. There, he will once again define the United States as a world leader and safeguard this earth for his daughters, Sasha and Malia, their generation, and those to come. And he’ll eat more danishes. At least, that’s what we hope he’ll do. The Copenhagen negotiations are the world’s chance to work together to cut carbon and solve global warming. If America is to be a true world leader, Obama must show up with bells on. His cardboard cut-out was optimistic today, stating that he would accompany his negotiating team, including Todd Stern and Jonathan Pershing, to the negotiations this December. 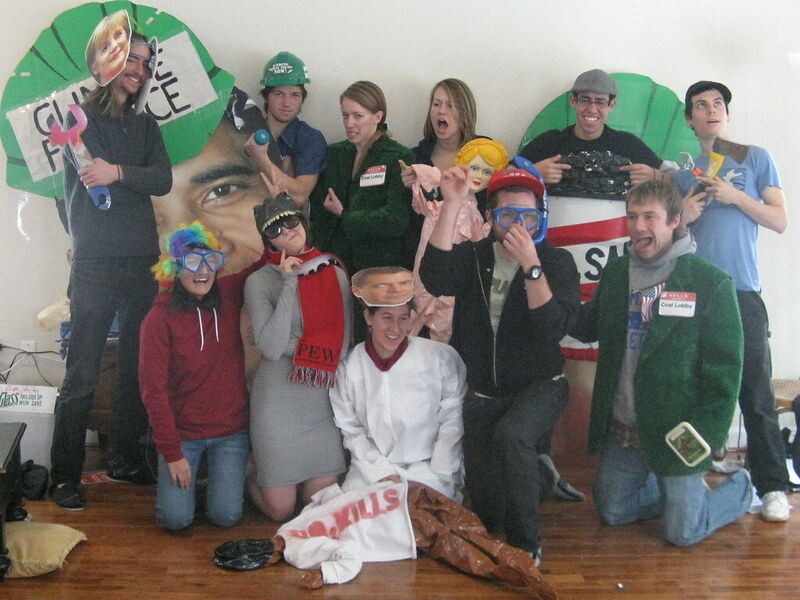 But we at the DC Action Factory would like to hear the real Obama commit to attending the treaty talks. Happy Birthday Obama! Obama to Copenhagen!